During the 19th edition of Amsterdam Fashion Week the new talent- and innovation platform ‘Fashion LAB’ was officially launched. In Fashion LAB, promising designers with small collections get the opportunity to make use of all the facilities needed to professionally present themselves to the international fashion world. Moreover, an on-going programme of workshops, lectures and coaching prepares the designers for their definitive breakthrough. With Fashion LAB, Amsterdam Fashion Week also makes an appeal to the fashion industry to support its talents and to contribute to the shared innovation platform. The catwalk show by Marga Weimans – a designer who has long outgrown the status of talent and forms a source of inspiration to young and ambitious designers – on Saturday the 13th of July, marked the kick-off of the Fashion LAB program. A select group of visitors got an exclusive preview in which the traditional allocation of roles between designer, models and audience was reversed. Thereafter, the collection of Marga Weimans was shown to 1.200 fashion professionals in the Gashouder-building on the Westergasfabriek-grounds. Visitors all received test tubes containing a request to share their knowledge and expertise and take an active part in shaping the future of the on-going Fashion LAB programme. During the 19th edition of Amsterdam Fashion Week (6-16 July 2013) no less than 12 different Fashion LAB catwalk shows take place, from designers such as Armand Michiels, Nata Ryzh, Dorhout Mees, Allan Vos and FREDFARROWBRITTAVELONTAN. By opening up Amsterdam Fashion Week to new and developed talents and by offering them the possibility to produce shared catwalk shows, Amsterdam Fashion Week distinguishes itself from fashion weeks in other metropolitan cities. 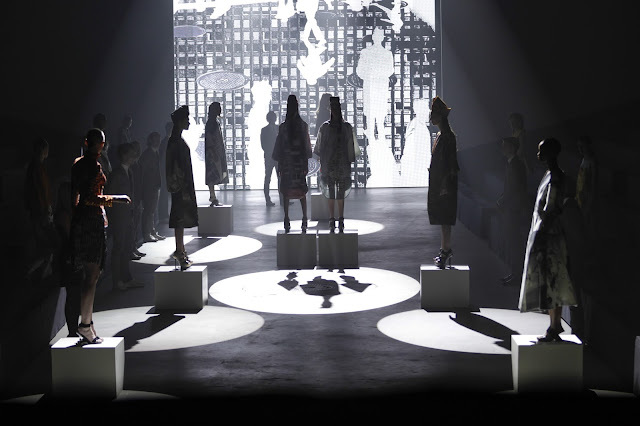 The talent- and innovation platform takes shape outside the catwalk as well. Various organisations already work together with Fashion LAB and its fashion designers: a beneficial relation for both parties. At ‘Daring Designers’, an event that took place in the run up to Amsterdam Fashion Week, Hilmar Mulder, editor in chief of Grazia and Natasja Kok, Vodafone Platform Activation Manager shared stories on how they respectively partner with Winde Rienstra and Marga Weimans. On the day Fashion LAB was launched, fashion designer and innovator Pauline van Dongen shared her vision on the application of technology in fashion, in an interview with fashion-icon Aynouk Tan. She for example printed shoes in 3D together with Freedom of Creation. Maartje Dijkstra and Local Androids presented their novel works where fashion, music, technology and innovative materials come together. The afternoon was organised by Vodafone Firestarters, that not only aims to inspire young designers with its activities, but also explores how the digital world can change a creative industry like the fashion industry . The Fashion LAB programme, as well as the 19th edition of Amsterdam Fashion Week, will be concluded on Tuesday the 16th of July with the catwalk show by Lichting supported by G-Star, in collaboration with HTNK and Het Nieuwe Instituut. In this show the greatest talents of the seven Dutch fashion academies make a first appearance on the catwalk and introduce their collections and their own identity to fashion professionals.